Pentagon's 1033 Program sparks "militarization" worries in civil libertarians. Rick Egan | The Salt Lake Tribune Lt. Alex Lepley stands inside a mine-resistant vehicle (MRAP) is being fixed up for duty at the UHP maintenance shop in Taylorsville, Monday, January 13, 2014. Rick Egan | The Salt Lake Tribune Lt. Alex Lepley stands inside a mine-resistant vehicle (MRAP) is being fixed up for duty at the UHP maintenance shop in Taylorsville, Monday, January 13, 2014. 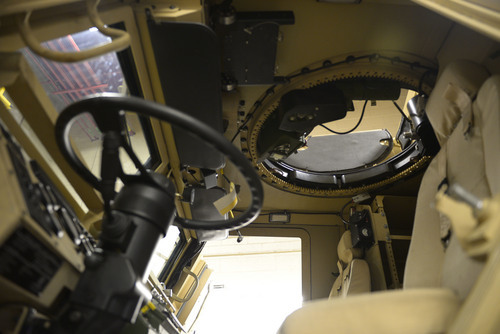 Rick Egan | The Salt Lake Tribune The inside of a mine-resistant vehicle (MRAP) is being fixed up for duty at the UHP maintenance shop in Taylorsville, Monday, January 13, 2014. 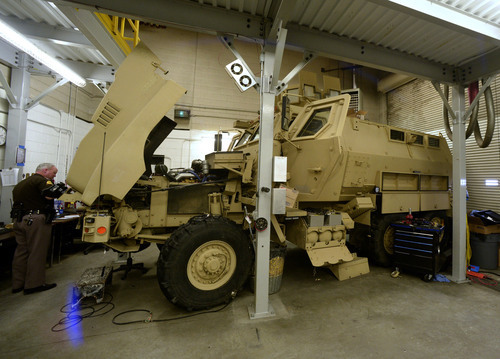 Rick Egan | The Salt Lake Tribune A mine-resistant vehicle (MRAP) is being fixed up for duty at the UHP maintenance shop in Taylorsville, Monday, January 13, 2014. Rick Egan | The Salt Lake Tribune A mine-resistant vehicle (MRAP) is being fixed up for duty at the UHP maintenance shop in Taylorsville, Monday, January 13, 2014. Rick Egan | The Salt Lake Tribune Lt. Alex Lepley stands inside a mine-resistant vehicle (MRAP) is being fixed up for duty at the UHP maintenance shop in Taylorsville, Monday, January 13, 2014. 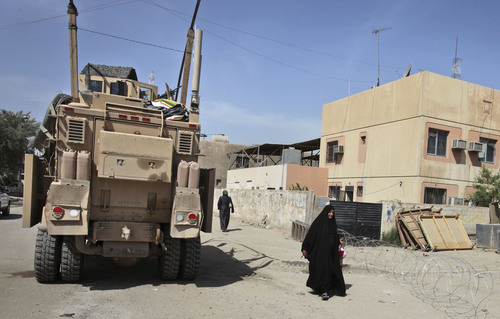 An Iraqi woman and child walk past a U.S. Army Mine Resistant Ambush Protected (MRAP) vehicle on a street in Baghdad, Iraq, Monday, March 8, 2010. 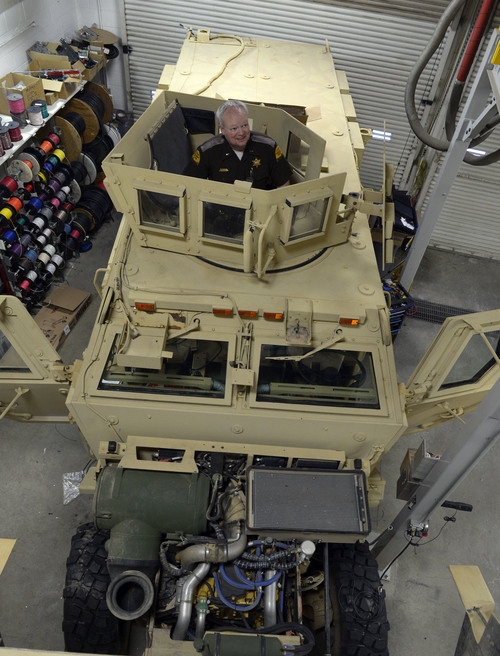 The Utah Highway Patrol and Iron County Sheriff's Office recently acquired their own MRAPs. (AP Photo/Karim Kadim) Rick Egan | The Salt Lake Tribune A mine-resistant vehicle (MRAP) is being fixed up for duty at the UHP maintenance shop in Taylorsville, Monday, January 13, 2014. 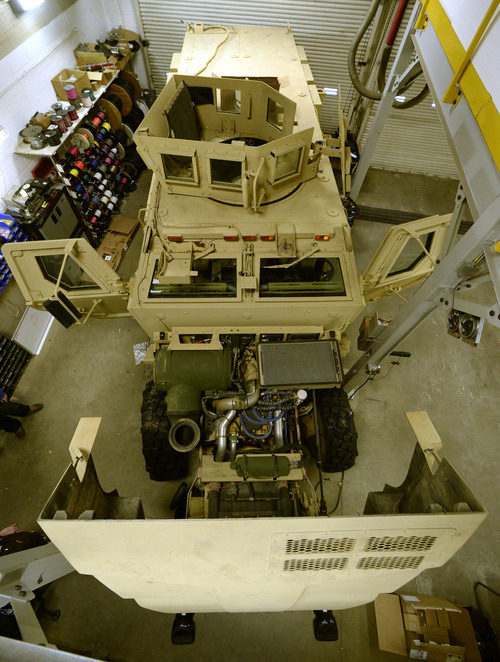 Rick Egan | The Salt Lake Tribune Lt. Alex Lepley stands inside a mine-resistant vehicle (MRAP) is being fixed up for duty at the UHP maintenance shop in Taylorsville, Monday, January 13, 2014. Taylorsville • Utah Highway Patrol Lt. Alex Lepley imagines a scenario where a man has barricaded himself, fired a gun at police officers and placed bystanders in peril. Enter UHP&apos;s new mine-resistant ambush protected vehicle, "MRAP" for short. Or at least that&apos;s what the U.S. Army called it. The U.S. Department of Defense recently gave a surplus MRAP to the highway patrol. The law enforcement agency plans to use it to carry troopers to dangerous crime scenes and to keep those troopers safe while protecting civilians. "Obviously, it is intimidating," Lepley said of the dump truck-sized armored vehicle designed to withstand bomb blasts in Iraq and Afghanistan, "but that isn&apos;t its primary purpose. It&apos;s saving lives. I can drive this right through the middle of a gunfight." 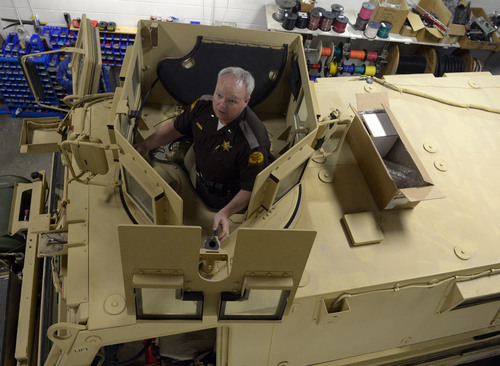 The MRAP is not the only gift Utah law enforcement agencies have received from the military. 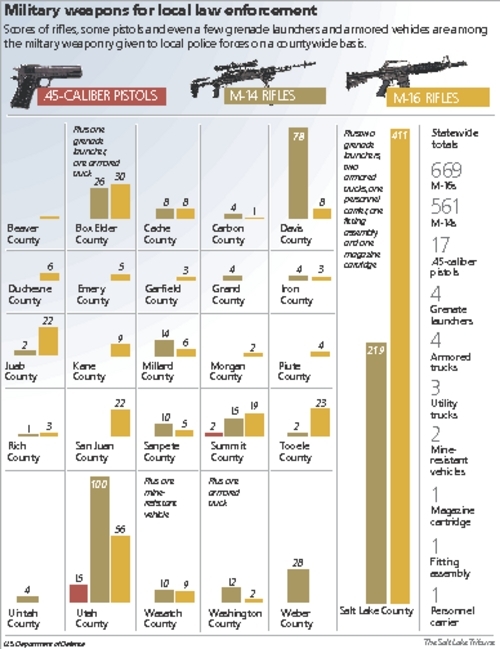 In the two-year period beginning in October 2011, Utah police received 1,230 rifles, according to records the Defense Department provided to The Tribune. Utah police also received four grenade launchers, 17 .45-caliber pistols and a handful of magazines and weapon accessories. Click here to see a map of where in Utah the weapons went. The Defense Department has provided the weaponry and equipment through what it calls the 1033 Program. As of an April 2013 audit, Utah police possessed $2.8 million of weapons and other military gear received through the program. While there&apos;s no available documentation that anyone in Utah has been shot or killed with weapons from the 1033 Program, civil libertarians have taken note and are voicing concern over what they call the "militarization" of local police. Connor Boyack, president of the Libertas Institute of Utah, said he&apos;s concerned the program gives Utah police a financial incentive to use more violent tactics than they otherwise might in an era when crime and police officer deaths are declining. "The data I&apos;ve seen is that the risk is decreasing, and yet the tools of defense are gearing up," Boyack said. The sheriffs and police chiefs who subscribe to the program say they are trying to protect the public and their officers. 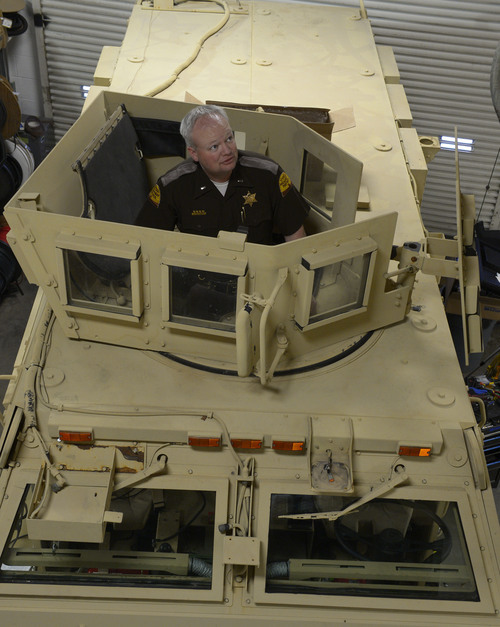 "I look out for the rights of my deputies," said Iron County Sheriff Mark Gower, whose office also received an MRAP. "They have the right to be protected in the dangerous work that they do." Blankets to guns • Congress started the program in 1996 to send military surplus gear to local police. According to the Defense Logistics Agency, the Pentagon office responsible for the program, it has given $4.2 billion worth of equipment to police, including $502 million just in 2011. The program provides more than MRAPs and rifles. Defense Department records show Utah police also have received emergency blankets, medical gear, camera equipment, pliers and a variety of other merchandise that sounds more like what you&apos;d find at a hardware store than at an armory. The Defense Logistics Agency would only provide an inventory of the weapons on a county-by-county basis. But the Defense Logistics Agency, in an apparent oversight, did provide a list of rifles the Lehi Police Department received. Sixty-two local police forces in Utah as well as three statewide agencies are signed up to receive equipment through the 1033 program. They must submit their applications for equipment to an office at the Utah Department of Administrative Services. Dan Martinez, who works at Administrative Services and is the state coordinator for the 1033 program, said in an email that he and his staff sometimes reject applications if they don&apos;t meet a specific law enforcement need. Applications deemed acceptable are forwarded to the Defense Logistics Agency for consideration. The Defense Department still owns the weaponry, although it&apos;s considered on permanent loan to the police as long as the gear is maintained, accounted for and never sold or given away. That proved a problem for Utah last year. A Defense Logistics Agency audit revealed one M-16 rifle was missing. The entire state was banned from the 1033 Program for about a month until the police force that lost the rifle developed a corrective action plan. Martinez said the M-16 has not been found. A shooting in Texas • How decisions are made within the 1033 Program is one of the questions the American Civil Liberties Union has. In March, the ACLU launched an investigation into the program, sending public records requests to 250 state and local police forces across the country, including 20 in Utah. Kara Dansky, senior counsel at national office of the ACLU, said the organization has received thousands of records, is analyzing the data and hopes to issue a report in the first half of 2014. Dansky said she&apos;s not yet in a position to offer formal findings or recommendations, but said there are anecdotes indicating the use of military weapons encourages police to use more violent tactics in circumstances that don&apos;t require it. "When police use military-style tactics and weapons to serve warrants on people&apos;s homes, what we&apos;ve seen is violence ensue," Dansky said. She pointed to an episode in December near Snook, Texas. According to the Bryan-College Station Eagle, a SWAT team received a no-knock search warrant to look for marijuana growing in the mobile home of Henry Goedrich Magee. Investigators didn&apos;t want to knock, the newspaper said, citing court documents, because an informant said Magee was armed, had an aggressive dog and they were worried Magee could destroy the evidence. The SWAT team entered the home just before 6 a.m. Magee&apos;s attorney has told reporters his client was defending himself and his pregnant girlfriend when he shot and killed 31-year-old Burleson County Deputy Adam Sowders. It&apos;s not clear whether the SWAT team used gear from the 1033 program. Dansky said the ACLU is also worried about transparency. The Defense Department is reticent to disclose what it has given to local police and there is no indication of how it decides what gear to give to which police force. Dansky said the ACLU is not examining the medical and emergency supplies the Department of Defense has sent to police forces. Boyack said he was not concerned with that aspect of the 1033 Program. Utah benefits • Despite those concerns and statistics showing criminal violence is in a decreasing trend, Utah sheriffs and police chiefs see benefits to the program. "Your bad guy, he&apos;s always out there training, looking for the biggest baddest thing," Wasatch County Sheriff Todd Bonner said. His office has received M-14 and M-16 rifles that go in his deputies&apos; patrol vehicles. Up the street from the sheriff in the county seat, the Heber City Police Department received four M-14 rifles. Both Bonner and the Heber City police chief said their departments wouldn&apos;t be able to afford the rifles without the 1033 program. A military-grade M-14 can retail for up to $2,900 and M-16s cost a few hundred dollars more. "What the majority of the citizens have expressed to me is: What are you doing to save money and not raise taxes?&apos; " Heber City Police Chief Dave Booth said. "This is it." The Heber City Police Department also received a Humvee, though Booth said its engine is blown. When his department replaces it, the Humvee will be decorated and used for children&apos;s programs and driven in parades. Each Wasatch County deputy now carries a pistol and has a shotgun and one of the military rifles in his or her car or truck. "Are they absolutely necessary? Well you never know," Bonner said. "It&apos;s good to be prepared. Will you ever use them? Hopefully not." Bonner pointed to the Feb. 28, 1997, North Hollywood shootout between the Los Angeles Police Department and two bank robbers wearing body armor. The police were firing pistols and a few 12-gauge shotguns, and could not penetrate the body armor. One robber, already wounded, killed himself during the shootout. Police officers shot and killed the other robber. Eleven police officers and seven civilians were injured. In September 1997, the Pentagon sent 600 M-16s to the LAPD. In his 2013 book, "Rise of the Warrior Cop: The Militarization of America&apos;s Police Force," journalist Radley Balko described how that shootout has been cited by police forces across the country as a reason to better arm officers. Boyack acknowledged that, supporting statistics or not, many police officers fear for their safety, and see the 1033 Program as a way to address their concern. "Short of some massive cultural shift, I don&apos;t see [the anxiety] decreasing any time soon," Boyack said. Not-so automatic • Not every police force wants the military gear just because they can have it. 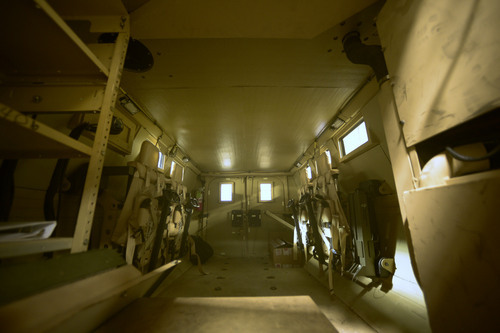 Both Booth and Bonner said their departments have no use for an MRAP or a grenade launcher. That&apos;s because they don&apos;t want to spend money to maintain the MRAP. In addition, the Summit County sheriff has an armored vehicle that can be deployed to Wasatch County. Gower, the Iron County sheriff, said he returned M-14s he received because the rifles did not fit in the cabs of the pickup trucks his deputies drive. Nor will every police force use its 1033 gear to its full military potential. Box Elder County Sheriff Lynn Yeates said the grenade launcher he received will be used to fire tear gas or other nonlethal rounds, not grenades. Also, Yeates had a gunsmith disable the automatic firing option on the M-16s the Defense Department provided. Bonner said the automatic fire function still works on his M-16s, but the sheriff&apos;s office has a policy prohibiting firing on that setting. 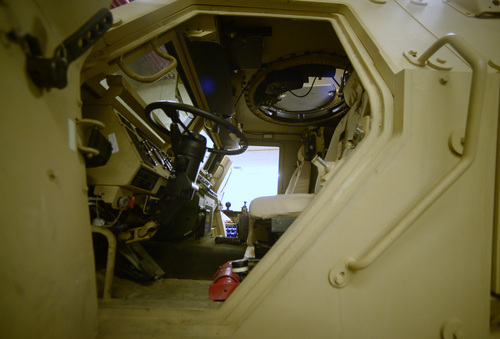 Both the Iron County sheriff and Lepley at UHP said they don&apos;t plan to permanently mount a gun in the turret of their MRAPS, although someone could stand in the turret and deploy a weapon through its 360-degree rotating shield. Nor will they use their MRAPs, which normally cost up to $600,000, to serve just any search warrant. Gower said the Iron County MRAP will be used in "very, very limited situations where we anticipate the possibility of someone shooting at us." Neither MRAP is operational yet. Both are being fitted with police lights and sirens, and undergoing interior refurbishing. The highway patrol and Iron County MRAPs also will be fitted with decals identifying them as belonging to police. Go to sltrib.com at 12:15 p.m. Friday for a Trib Talk about military weapons going to Utah police. Watch the discussion online and send questions on Twitter with the hashtag #TribTalk.